One of the things I enjoy most in life is getting to know the native landscape in which we live, feeling rooted in a sense of Place. I love to experience the incredibly varied natural habitats of our state. North Carolina’s longleaf pine savanna, with its many colorful wildflowers, is one of our most diverse natural communities. Longleaf used to be the dominant forest of the whole southeastern coastal plain (90 million acres), but only about four percent of it (4.7 million acres), along with its complement of unique plants and animals, remains or is being restored. Brunswick County in southeastern North Carolina has particularly rich longleaf pine communities. Recently we set off on a three day fieldtrip with our naturalists group that Jerry, our leader, dubbed “Brunswick Adventure.” I’m thinking yeah, the Green Swamp should be good and swampy, given all this rain! 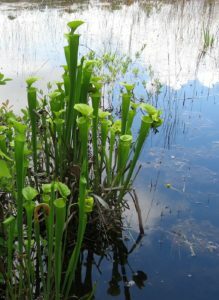 In fact, one of my favorite adventures turned out to be slogging through the shallow waters and mud of the saturated grasslands of the Green Swamp’s Shoestring Savanna to visit four different species of pitcher plants: yellow, purple, sweet, and hooded. 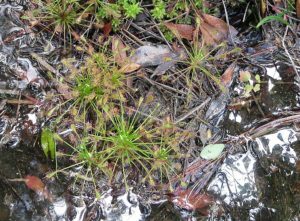 We also saw blue butterworts, sticky sundews, and Venus flytraps in bloom. Quick six-lined racerunner lizards darted about amongst the twenty-some species of carnivorous plants. We only spent a short time at the Boiling Spring Lakes Preserve, another remnant of the Greater Green Swamp that used to cover 200,000 acres of southeastern North Carolina. Thunder and approaching rain made us leave rather quickly so we wouldn’t get caught a mile down the trail in a storm. My favorite experience there was coming upon a large river cooter in a dry sandhills area. 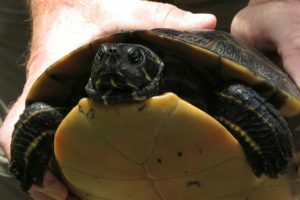 Jerry, a herpetologist, picked her up, and, feeling how heavy she was, said she was full of eggs and had come up on the sand ridge to lay them, perhaps to avoid the raccoon predators at the pond. I love learning bits of eco information like this in which ridge and pond, turtle and raccoon become connected, and I can picture myself there lurking among them. Wanting to stay dry, but still wanting to explore, we decided to drive along the route I had taken with the Native Plant Society one spring to try to find some of the region’s twenty-one species of orchids in the wet areas along the roadsides. Otherwise know as ditches, these have become important refugia for disappearing species. (See my drawing here.) 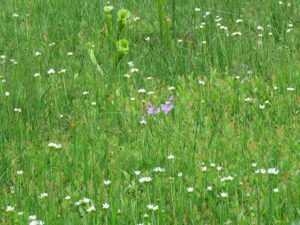 Spotting some pink orchids called spreading pogonias, we turn down a suburban street and park to see them and many white flowered Venus flytraps. After we’ve been exploring for a short while, a man in a black truck stops, almost blocking our minibus. I wonder if he thinks we’re poaching flytraps. (In the whole world they only grow in a 90 mile radius around Wilmington, North Carolina, and poaching was a huge problem until they were given state protection making it a felony.) He approaches the bus slowly with his window down and asks Martha, our co-leader, “Y’all seen any Venus flytraps? I haven’t seen any flowers.” Martha, fearing he might be a poacher, waves her hand vaguely and says, “Oh, they’re around.” Then he asks her what group she’s with. “The Museum of Natural Sciences in Raleigh. We’re here to see the flowers,” she answers. “Well,” he says, “you need to come see them in my yard.” So we get back in the bus and follow the truck to his house. As we’re walking toward the lake behind his house we start to see hundreds of Venus flytraps. I’m fearing he’s going to tell us he dug all these from the swamp, but no, he, Terry, says he just leaves this low area at the lake unmowed. I glance across the lake at the manicured lawns and ubiquitous landscaping. 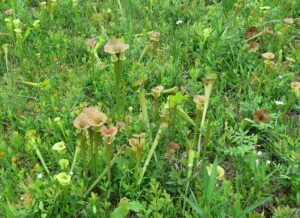 We had never seen so many yellow and purple pitcher plants, orange milkworts, and Venus flytraps packed into one area. 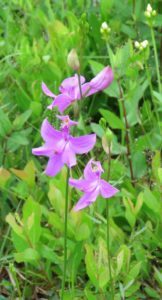 There are even a few grass-pink and rosebud orchids. He tells us that he lets a man come and harvest the seeds of the flytraps to propagate them legally. And, by the way, we can come back to see them any time. I’m full of mixed feelings, both glad to see some of the incredible diversity of this place and sad to glimpse this taste of what’s mostly being lost. 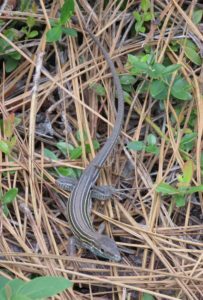 Brunswick County is, or was, the most biodiverse hotspot in all of North Carolina. Most of the Green Swamp was ditched and drained long ago, and what remains is being sold off for big housing developments. 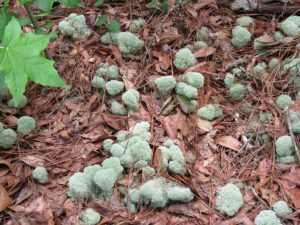 The natural vegetation of the longleaf pine savannas with their gorgeous wildflowers and rare, endemic species, along with the evergreen shrub land called pocosin, is being scraped off and replaced with sidewalks, lawns, and generic landscape shrubs. It’s heartbreaking. Leaving Terry’s we talk about how wonderful it would be if the native vegetation of this special place was allowed to remain around each house, like his, instead of replaced with completely unnatural palm trees. We were awed by this strange set of coincidences. If we hadn’t happened to go looking for roadside wildflowers . . . ; if we hadn’t turned down this particular street . . . at this particular time . . . ; if Terry hadn’t been leaving home at this exact time . . . . A coincidence that is meaningful is called a synchronicity. For me the meaning was that I should write about it. On our last day we visited a nearby nature preserve called Ev-Henwood, pronounced “heaven-wood,” that contains upland coastal plain forest, longleaf in the process of restoration, cypress swamp, and rich bottomland hardwood forest. In the uplands we were charmed to come upon whole fairy forests of magical round lichens called oak toes. We enjoyed eating our way through wetter areas of the forest on ripe blueberries from one of the many species of blueberries and huckleberries we passed along the trails. 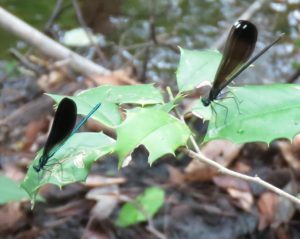 We were amazed to come upon flocks of large, beautiful ebony jewelwing damselflies darting about at several places where the trail crossed the swamp. Hearing red headed woodpeckers, prothonotary warblers, Acadian flycatchers, ovenbirds, great-crested flycatchers, yellow-throated warblers and a barred owl added to the swampy milieu. My favorite adventure was slogging through the blackwater swamp, careful not to trip on submerged cypress knees, to a huge old bald cypress affectionately named Gus. 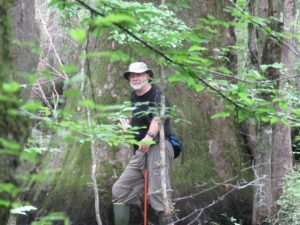 I don’t know how old Gus is, but the Nature Conservancy says that recent core sampling of cypresses along the nearby Black River has dated one of them to 2,500 years old, much older than the 1,600 year old ones previously reported! These are the oldest trees east of the Rockies and the oldest bald cypress trees in the world. There are very few of these big, old cypresses left. This is another example of the critical decisions we as a people need to make to appreciate and save or to ignore and lose our ancient wild heritage. I lingered there with Gus, thanking and blessing him, wishing him a long life. An indigenous perspective would be to see these great beings as our elders, or even our ancestors, with whom to enjoy a kinship relationship of reverence and respect. What would Gus say to us if we were to ask him to speak to us, his descendants, about our proper, life-inhancing role as fellow beings in this landscape? A few days later it was Memorial Day, a day to grieve and pay tribute to those Americans lost. A friend and I chose to spend the afternoon making a ritual to honor the grief we feel for the demise of the natural world that we are witnessing [see post here]. I got to express my sadness for the loss of the beautiful and intricately woven web of trees, grasses, orchids, flytraps, and lizards of the longleaf savanna and for the ancient cypress elders who were cut down before their time. Good memorial services also feature lavish praise in which we, the bereaved, get to passionately express our love for those who are no longer with us. We draw tighter together, laugh with tears in our eyes, and are very thankful for those who remain. Thanks, Jill. I know you so appreciate the beauty of all the precious life forms around us. Diantha, your words, in turn, water and refresh my soul. Migwetch, dear friend. What a beautiful story. I would love to go on a future adventure with you! I love the photos, too. Thank you, Donna, for your kind words. Yes, I think you would very much enjoy an adventure in the wilds with us and the Museum folks! I read this, and observe the beautiful photos and drawings, with a mixture of joy and sadness. I fear the loss of so much beauty, the web of life that is so apparent in places like these. Where and how do we need to work? I sometimes feel that somehow we must educate and inspire developers, and their hired landscapers, so that they see this beauty, and want to find ways to preserve it. But we also need a way to help people see monoculture lawns and non-native flora as the wastelands they are, and to begin to enjoy some wildness around them, and not be afraid of it. Is it fear that makes people want to live outside the forest, away from the grasslands? Or is it just that they have never been in nature, with a kind guide and mentor, to see how we are all part of a system of life, each species with its own interesting-ness, and place for the other. For those of us who have been lucky enough to see in this way, our role seems to be two-fold–supporting each other, and finding some way or ways to help others see this beauty. 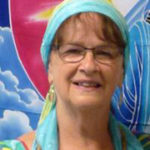 When I read your words and see the beauty through your eyes, Betty, I feel supported in my own small work of helping my grandchildren, and the folks we visit for New Hope Audubon’s Bird-Friendly Habitat Certification program, and even my husband, feel affection for the interconnected miracles of life in the guise of flora and fauna of Place. Barb, yes, I think it is partly the lack of positive experiences of the natural world that shape our growing “plant blindnes,” and partly our culture of mass advertising and marketing that influences what is available and what people, therefore, ask for. Your work with your grandchildren is the basis for their lifelong intimacy with nature. Your work with Audubon educating homeowners, landscapers, and garden centers is so important in helping people make more informed choices about the value of native plants and native ecologies. I am thankful to share support with friends such as yourself, because the joy is too precious to keep to oneself and the grief is too much to bear alone. Thanks, Debbie. And you helped create the story, being a fellow adventurer!